We’ve had a wide array of cinematic story trailers, but now it’s time to see actual Red Dead Redemption 2 gameplay. 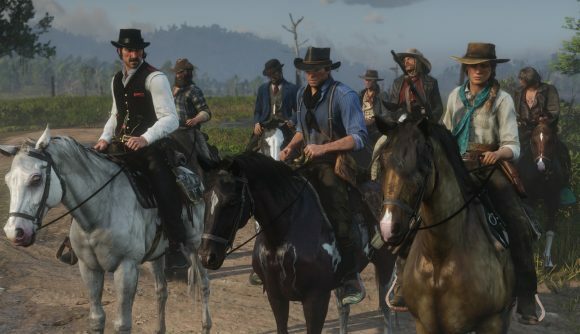 Rockstar has confirmed the release of an “official gameplay video” for tomorrow, August 9, at 8:00 PDT / 11:00 EDT / 16:00 BST, which will finally let us take a look at how the open world western actually plays. Rockstar has more or less stayed true to the marketing formula it set forth with Grand Theft Auto V in promoting Red Dead Redemption 2, with a series of story trailers built from in-game cutscenes followed by a gameplay reveal close to the title’s launch. If the video itself follows the same formula, expect a roughly five minute narrated breakdown of the game’s mechanics and open world structure. The content of the video will likely be similar to what was shown to press earlier this year, where we first saw info about the return of the Honor and Dead Eye systems, along with plenty of details on the open world and the overall structure of the game. Notably absent from those previews were any details on the game’s online mode. I’d expect multiplayer info to be held back here, as well, since that was how the launch of GTA5 went down. It’s not a perfect predictor of how Red Dead will go, but the formula’s held true so far. The other thing that formula tells us is to expect a PC port – eventually. Rockstar and Take-Two have been maddeningly cagey about Red Dead Redemption 2 PC, the continued popularity of GTA Online on Steam makes prospects for the port good, though it’s still as yet unconfirmed. If you’re going with a console version in the meantime, the Red Dead Redemption 2 release date is scheduled for October 26 on Xbox One and PlayStation 4. Follow that link for more details on everything we know about the game so far, and tune into the Rockstar YouTube or Twitch channels if you want to see the new video as it goes live tomorrow.